If you're wondering where that disgust was coming from, I probably only need to a highlight a previous post of ours: 22-Year-Old P.O.W. Kurt Vonnegut Writes Home from World War II: “I’ll Be Damned If It Was Worth It”. There you can read all about how he was taken prisoner during the Battle of the Bulge; spent time in a Dresden work camp known yes, as “Slaughterhouse Five;” survived the Dresden bombing; saw many other atrocities along the way, revealing civilization at its worst. You can hear Vonnegut read from Slaughterhouse-Five here. Or rather a civilization with great potential, but which is still rotten to its core. You sound like you have led a privileged life. One in which you’ve never so much as scraped an elbow or had your face rubbed in dirt by the school bully. nTry reading a little more about Vonnegut before you reveal to others the vast extent of your abilities to incorrectly and with insufficient evidence surmise the totality of a person’s psychological makeup, summed up in three, woefully superficial words. Vonnegut dares us to confront issues and inspire change. Sour little men often do. 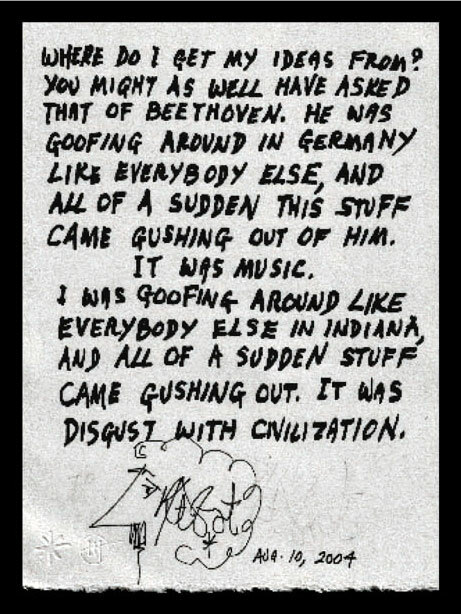 Vonnegut cares. Does anyone know where I can get this quote picture made into a canvas poster?